"Wow, what color, that fish is awesome", was the first thing I thought when the California Tiger Endler's Livebearer was first produced by accident at Aquaworld. At Aquaworld we have 120 gallon acrylic tanks that are divided into cells with acrylic dividers. On our Livebearer Row we had guppies and Endler's livebearers right next to each other. Occasionally the livebearers would jump over the divider and end up in another cell. In this case we had a male Endler's Livebearer jump over the cell wall into a tank of Yellow Micariffe Guppies that we had been breeding. It didn't take long for the Endler to breed with the guppies. After a month and a half we noticed a beautiful fish that was obviously a cross between the Endler and the guppy, that had out standing color with a uniquely Endler look to it. 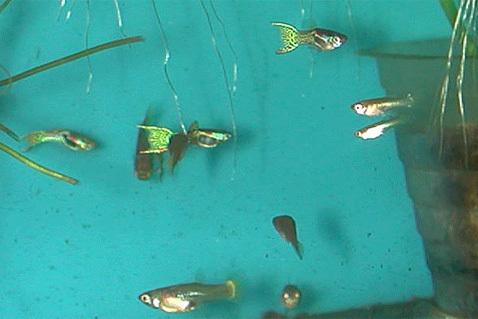 The fish has a yellow/green pattern broken up by black over the majority of the body and tail, the classic Endler black chest, and a double sword tipped tail. Many specimens show orange markings in the typical location on the body for classic Endler. The dorsal fin is the last part of the fish that colors in young the males and it typically has the yellow/green pattern. Like a finger print, no two males have the same exact color pattern. The female looks much like the typical female Endler with the exception of just a hint of yellow on the base of the tail. We decided that this had to be reproduced for the tropical fish hobbyist trade. We set up tanks in our back room with lots of live plants to develop this fish. The tanks we used are standard 55 gallon acrylic tanks with built in dividers. We mostly use Italian Val in plastic pots using the Supersoil technique for growing plants. We use either one or two 40 watt fluorescent bulbs. When the Italian Val gets to thick we harvest some and sell out of our retail tanks. At first most of the fish that were growing out looked like typical Endler's Livebearers, with some blonde guppies, with about 20% of the males looking like the fish we are trying to develop. Though regular weekly to bi-weekly culling of undesirable fish we have nearly got the fish breeding true. The first public offering of this fish will be at the 4th Annual FINDIG public auction in October 2004. If you are a fish geek and you have not attended a FINDIG yet, you are missing out. FINDIG is a 3 day convention for aquarium hobbyist that includes many notable speakers, and aquarium trade manufacturers. Some of last years FINDIG speakers were Ad Konings, Paul Louiselle, and Bob Fenner.